Oh the luxury of the double sink. Is there any better invention in the master bathroom? One can dream can’t they? Make your own double sink bathroom on DreamHouse Designer. It’s free! With Spring quickly approaching beautiful blooms are popping up everywhere. Even if it’s not on the trees themselves, I’m finding it more important to have fresh flowers in my house to cheer me out of the winter blues. 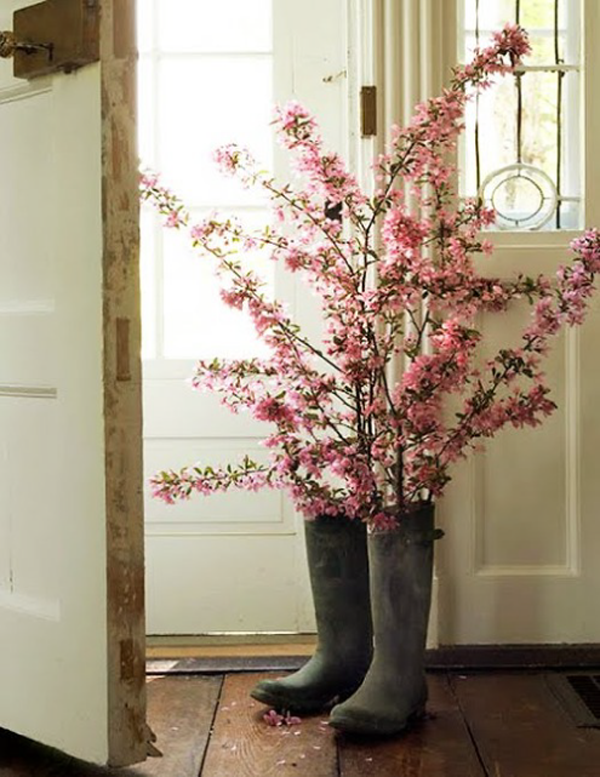 I love the idea of using an old pair of rain boots for a vase or even a planter ( if you drill holes in the bottom). What do you think? Either dip dye or ombre the effect is the same = foxy. With fall quickly approaching (say it isn’t so) these finds remind me of the changing color of trees. There are TONS of online tutorials so go get your dye on. I’m thinking napkins, towels, pillows – anything that is standing still basically. This means that my fam might be getting some handmade gifts this year. 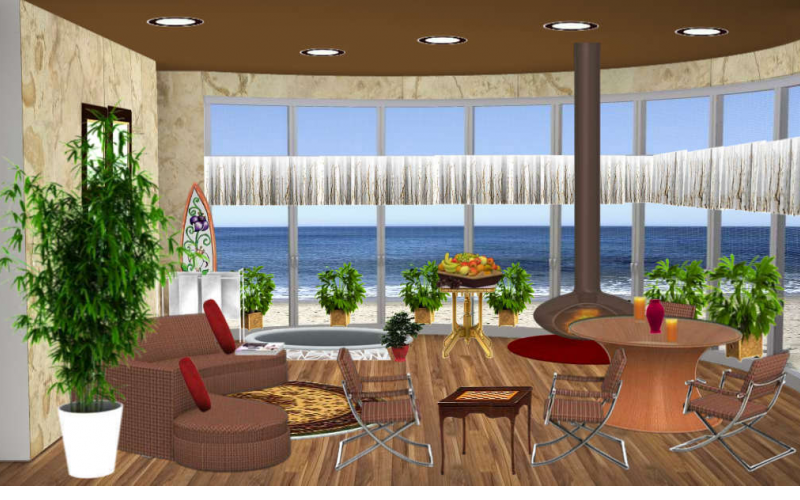 In other news, check out Digital DreamHouse – design at the click of a mouse. Beautiful, no? LIKE the FB page here! 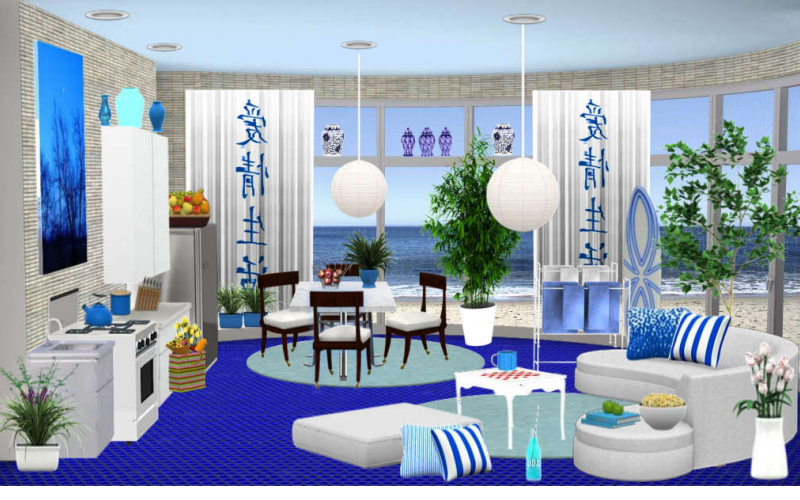 The neural colors of this room really let the blue ocean shine through. The different hues and textures of the wood really give it depth. And of course you need a pile of fresh fruit to keep your energy up. Great job. What a cool, fun room. Lots of bright colors to keep the energy going. The flooring is one of my favorite touches. Of course you need a supply of surf boards if you are living on the beach. Blue like the ocean, white like the clouds. This room is so chic. I love the addition on the different throw pillows and the dark brown of the chairs really gives it elegance. Simple, fresh and clean. 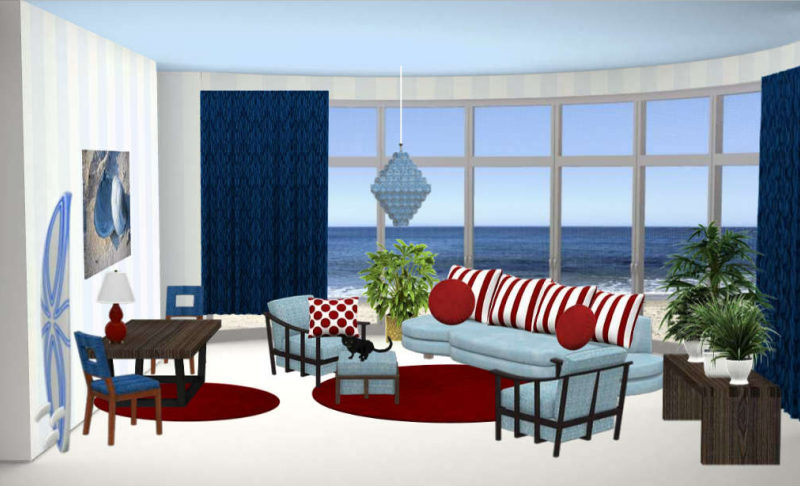 Great use of the different hues of blue with pops of ruby-red pillows. I love that there are a lot of different sitting areas. Great for entertaining. Congrats to all the winners and thank you all for participating. 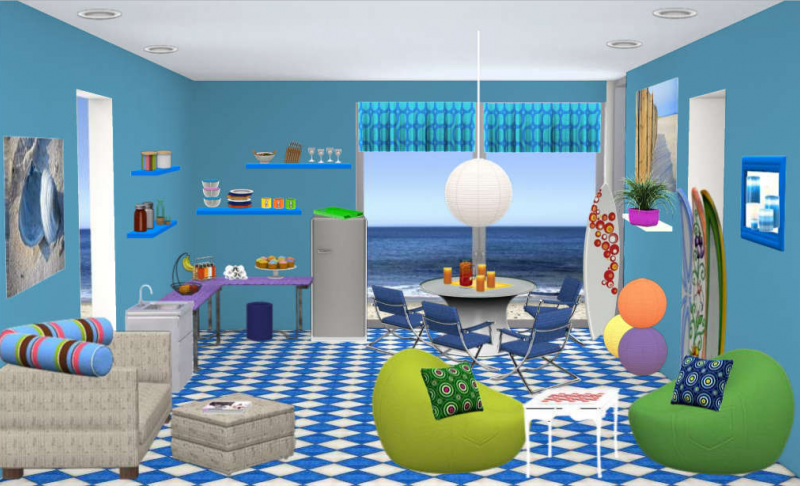 CLICK HERE to decorate beautiful, photo real 3D dollhouses with gorgeous furniture, wallpaper and more.